I'm from Africa precisely from Nigeria. Being one of the most fashionable countries in the world ( yes, you heard me right), looking good comes almost as a natural thing for the average Nigerian woman.The Nigerian woman loves to match her outfit way ahead of any occasion. This includes the outfit which could be traditional or western , the headgear (which we call gele), the shoes and of course the jewelries. "Sets?!" What do I mean? I would explain now! 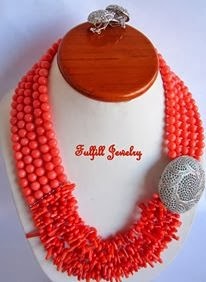 In the jewelry world here in Nigeria, we buy and wear most of our jewelries in matching sets. By sets, I mean, earrings, pendants/necklace,bracelets or and rings in similar design and colours sold together. They have to be the same especially, the earrings and necklace and or pendants. That is, and has been the trend in Nigeria. Even in the beads and non-beaded jewelries, most of the designs are sold in that manner. 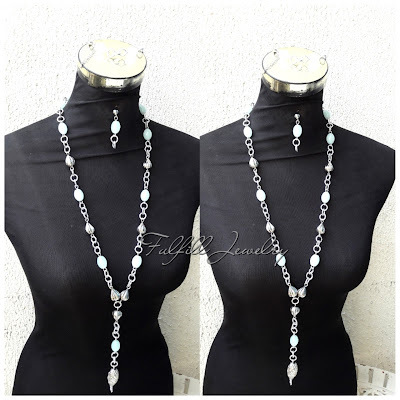 It's rare to find an average Nigerian woman wearing her jewelries which do not come in sets. Yes, we do have a few that would wear seperate piece as a necklace, another design of earrings together but its not a popular trend. The most common jewelry set is earrings with matching necklace. This is followed by the 3-in-1 which includes, earrings, necklace and bracelet. Next to this, is the earrings, pendant/necklace and bracelet. The ring is not mostly included, as any piece can be worn on its own. Also, I have bought jewelries seperately and matched them to go with my outfit. I guess you can equally describe the combination as a"set" because they have to blend together. Another common thing with the Nigerian woman. This is an accepted trend also when it comes to jewelries here. Did I also mention that we love it sparkling, shiny, bright and glamorous! The Nigerian woman loves her jewelries colourful and loud (for some..lol). We love beads (traditional or modern), we love crystals (swarovski or czech or chinese), we love our jewelry styles (multi-strands beaded jewelries, so hot here!) and most importantly we love our fashion sense! Do you agree with me Nigerian ladies? Let me know! We are readily available to satisfy everyone. Thanks a lot! Very pretty jewelry sets. Loved the black one. They really make a statement.